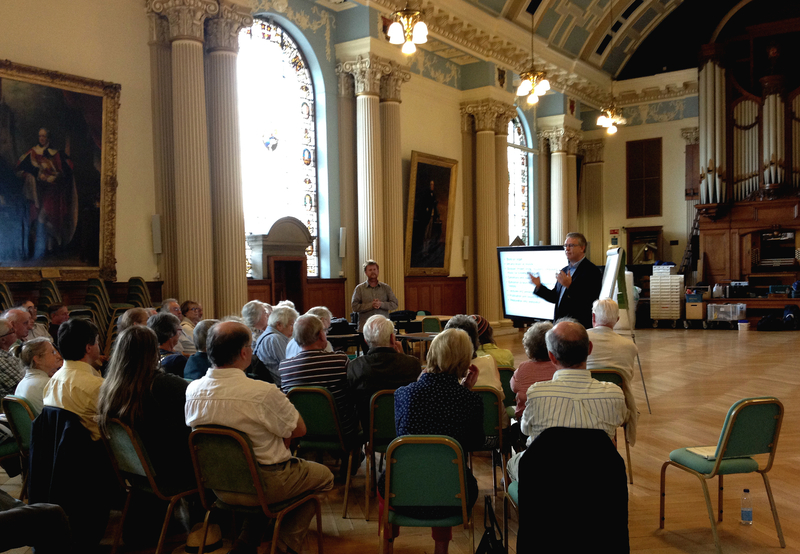 On Monday 14th July the first public meeting concerning the restoration of Colchester Moot Hall Organ took place, following the confirmation of a large grant from the Heritage Lottery Fund. Hosted by sound artist and composer Duncan Chapman, and organ consultant Dr William McVicker, the meeting was an opportunity to talk about the organ’s history and its role in Colchester’s civic life, to share stories related to the organ, and to discuss plans for outreach activity and celebrations around the organ’s reinstatement in 2015. Monday 14th July also saw the first day of work by Harrison & Harrison, the Durham-based company responsible for restoring the Organ. If you look very closely at the picture below you can see their boxes and equipment laid out in front of the organ, ready for them to carefully begin removing the pipes! Over 100 people came along to talks throughout the afternoon and early evening. Thanks to all those who attended, and we look forward to meeting you all again at future events.